Horace James "Horse" Hendrickson (August 24, 1910 – May 22, 2004) was an American football, basketball and baseball player, coach, and college athletics administrator. He served as the head football coach at Elon University from 1937 to 1941 and at North Carolina State University from 1952 to 1953, compiling a career college football record of 35–28–1. 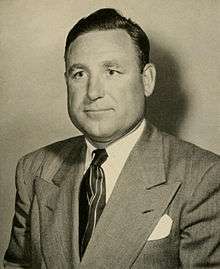 From 1937 to 1941, Hendrickson coached at Elon University, where he compiled a 31–12–1 record. His best season came in 1941, when his team went 8–1. For much of the 1940s, he was an assistant coach at the University of Pennsylvania. From 1952 to 1953, he coached at North Carolina State University, where he compiled a 4–16 record. Hendrickson played football, basketball and baseball at Duke University. He then served as director of athletics at Elon University, and coached football, baseball and basketball from 1937 to 1942. In 1942, he moved to the University of Pennsylvania replacing Howard Odell as the backfield coach on the football team. Hendrickson was married to Gene Fulton Swartz of Derry, Pennsylvania on June 18, 1938. The couple had two sons: Richard Fulton and James Alva. ↑ "Elon gets $2 million donation". News14. December 5, 2007. Retrieved January 1, 2011. The Hendrickson's made their donation in honor of Jay's father and former Elon Coach Horace Hendrickson. He served as director of athletics, and coached football, baseball and basketball. ↑ "Derry Girl Wed on Saturday". Greensburg Daily Tribune. June 20, 1938. Retrieved March 2, 2011. ↑ "Horace James Hendrickson". The Nystroms of Apex, NC. Ancestry.com. Retrieved March 2, 2011.